How To Avoid Breaks During Speaking English? Speaking English fluently is a difficult skill, but thanks to a lot of exercises, practice and regular contact with this language you can speak better and better. Firstly, you don’t have to be afraid of speaking. Don’t give up! Don’t make breaks during learning. It can cause a language barrier, because you will forget a lot of words. When you start learning English, continue it. Secondly, you try to speak naturally. Don't focus on the grammar and sentence construction. 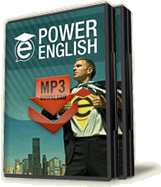 Learn more about Power English lessons! Don’t make sentences in your head and then speak. Everybody makes mistakes, so it isn’t important that you have used a tense incorrect. Next time you will do it correctly. Thirdly, try to have a contact with English every day. You can listen to music, watch film, chat, talk with someone or read articles in Internet. It helps you not to forget words. You can also get to know new phrases and make your foreign language more fluent. There is also a good habit of learning for example ten words a day. If you have less time, you can try to remember five words. Monthly you can remember 150 words!